There were 12 teams registered to compete. We had three courts of 4 teams competing in pool play. Standard pool play format. Each team was given a national team player. Some were given more than others but hey, not gonna complain. There were adaptive athletes paired with each team, as well as adaptive PE teachers, PT’s and other folks who work with children or adults with a disability. Lastly, all able-bodied players were added to complete a team of 6. We had a very low-key instructional clinic from 9am - 10am. It consisted of national team players giving us a quick recap of movement, hitting and serving. There were so many folks on the floor, it would have been nice to properly demonstrate the different styles of movement and core fundamentals to get you started, with better organization for so many bodies. Team Angel City finished 1-2 in pool play. We had a strong first win. Our second match was surprisingly so close. We played a team with Kelly Claes - current men's sitting coach - three national team men's players and some stellar male collegiate players. We held our own; it was so awesome! We played our third match right after lunch and it was our least successful match of the day. From there they took the top two teams from each pool to a winners bracket where they continued to play. There was no alternative for the rest of us who hadn’t placed in the winners bracket. Definitely need to have an option for a consolation bracket when we do this as players who traveled were looking to play more. There were so many folks to network with. I spoke with John Speraw, US Men's National Team Coach. I met Dave Shoji who is considered a coaching guru after his retirement last year; he spent 42 years at Univ of Hawaii. I could not let that man walk by without expressing my respect! I spoke with the men's sitting team coach as well with Gary Moy who I met at the USA/BRAZIL match in Anaheim last year. I made sure that man knew what myself and Angel City Sports are looking to do to bring the game to a greater audience in LA. The American Sports Center in Anaheim is where the US Men's & Women's National Teams practice, where USA Volleyball staff work (upstairs); its a must have venue for volleyball. Something to keep in mind. From a sitting volleyball coaching perspective this was amazing to be a part of. Team Angel City Sports played with tenacity and pride! 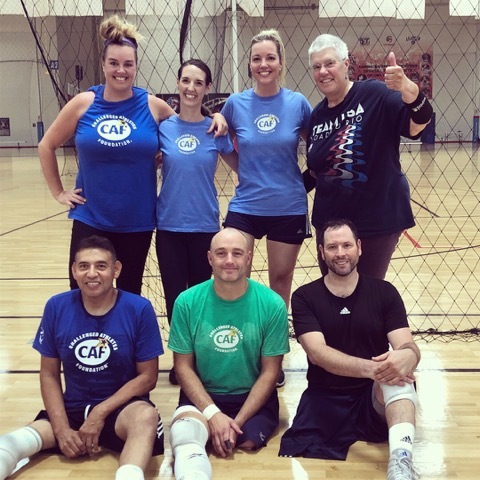 Allison Compton and I worked the entire floor, representing Angel City Sports and making it known we would like to continue practicing and playing sitting volleyball. Lots of positive feedback and encouragement from those we spoke to. Allison was great to have with me, she introduced me to every USA Volleyball person she knew as well as players, old teammates and other pertinent names. I felt like we made our presence known and folks learned more about Angel City Sports prior to their departure. Personally, I was in volleyball heaven. It was a really great day for me - loved every second! I have included some images from the day. It was hard to get what I wanted while playing and networking in a very hot and sweaty gym. I can’t express how grateful I am to be connected to this. It means the world to me.